"The Girl in the Spider's Web" also among a new wave of female-led movies. The recent backlash to misogyny in all corners of society have been organized and public and woman-led, from circulated lists of possible predator bosses to hashtag campaigns against sexual harassment. And like most cultural moments, it’s filtering its way down into our movies. Take the just-released, new Halloween – actually a new Halloween sequel. Was it a hit? And that’s mostly because this is a different Halloween – one in which the female victim has become, quite explicitly, a female fighter. 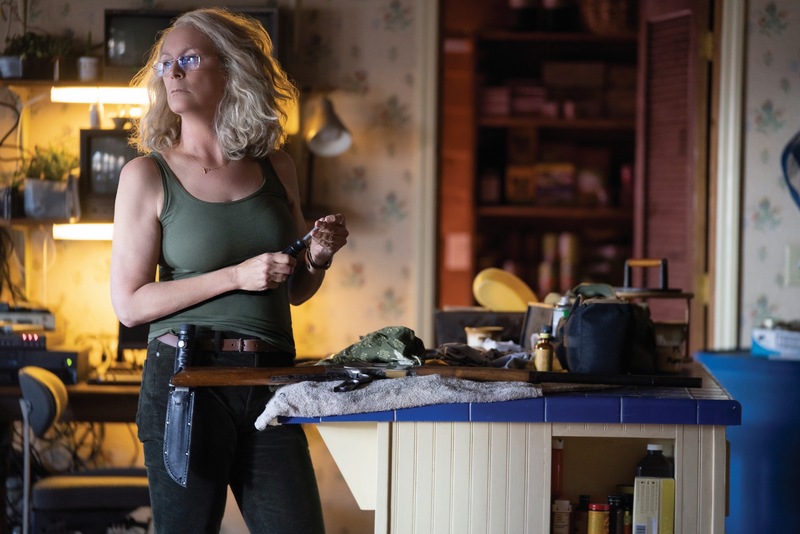 But Curtis’s Laurie Strode is the leader in a new legion of women warriors who are waging their own movie battles against male villains, and winning them without male help. It’s a definite change. In 1978’s original Halloween, Curtis’ virginal Laurie was the sole survivor – the “final girl” in modern slasher-film speak – but it took a male authority figure, Dr. Loomis, to rescue her and dispatch the villain. (Hmm – or did he?). Halloween II, the 1981 sequel, repeated that scenario almost exactly. Two further films eliminated his character, but still presented her as deeply damaged. Laurie has a mission and – well, no real spoilers, but in this film she holds on to her sanity, and she survives. And she needs absolutely no male help to do it. We’ve had female action-adventure heroes before, but earlier films were a little hesitant. Wonder Woman started out well, but by the time of Justice League Diana was playing Mother to the bratty Batman and Aquaman. Ocean’s Eight was lively, but still basically a gimmick – like an all-female version of 12 Angry Men. You saw the beginnings of a bigger change, though, in Black Panther. The film garnered plenty of praise for its thoughtful Afrocentrism, but its kingdom also featured fearless, brilliant females in charge of traditionally male fields like security and science. Wakanda wasn’t feminist because it was a utopia; it was a utopia because it was feminist. Halloween continues that empowering trend – and upcoming films like The Girl in the Spider’s Web and Widows promise to expand it. And they all share some things in common. First, the look of their heroines. They may be 60-something (Laurie is a grandmother by the time of Halloween); 40-something like Viola Davis in Widows or 20-something like Claire Foy in The Girl in the Spider’s Web. But they are all similarly lean, fit, muscular. These feminist heroines don’t obsess over hair and makeup, either, or dress in the fetish-wear of former female action characters like Catwoman or Black Widow or Jennifer Lawrence in Red Sparrow. Boots and denim are good enough for them – they have work to do, and they need to be comfortable. Not surprisingly – and perhaps, even ironically – these characters also favor the slim undershirts once known as “wife-beaters.” Because while those tops show off the women’s taut, muscled arms, they also – at least subconsciously – remind us of the sort of characters they’re going after. Spouse abusers. Women killers. Child molesters. It’s not a gender war per se – I know, you already said it, #notallmen – but while these women don’t hate men, they don’t need them as allies in their war against the world’s toxic males, either. In fact, even well-meaning men only seem to get in the way. Lisbeth Salander has some allies, but really, why? She is focused and fierce. She can race motorcycles, win any mixed-martial-arts fight, and keep going hours after taking a bullet. A brilliant hacker, she can re-program an airport’s entire security system from her cellphone. So tell me again, why does she need Mikael Blomkvist? You know, that sad-sack investigative journalist? She doesn’t really need his help in solving mysteries – that would be like Bill Gates needing help installing his own Windows updates. She certainly doesn’t need him as a lover. So why is this guy even around? And then you realize – although Lisbeth is completely up-to-date, the good old genre she’s stuck in isn’t. It still needs an attractive, sympathetic victim – a character who can blunder about, and get kidnapped, and give the protagonist someone to rescue in the third act. And since Lisbeth is clearly the hero, that means the damsel in distress has to be a man. The new female action movies provide a welcome catharsis after a long ugly period of Weinstein charges and Bill Cosby trials. Our onscreen sisters are not only doing it for themselves – they’re doing it to the kinds of ugly harassers and violent offenders who’ve been keeping them down all along. Of course, like all course corrections, this movie trend could go too far, turning these characters into cartoons. Lisbeth Salander isn’t as damaged in this new incarnation as she was in her debut, The Girl With the Dragon Tattoo. She’s also so indestructible – she sutures her own wounds, courtesy of a tube of Crazy Glue – she’s practically a superhero, an only slightly-less-ripped, gender-swapped Mark Wahlberg. Which, I don’t think anyone needs. But until we reach that wonderful place where mainstream Hollywood movies actually give us well-rounded, recognizably human women, we’ll settle for these unreal, exaggerated, superhuman ones. In fact, we kind of need them – if only to give current women warriors their due, and inspire the next generation of heroes, already massing for the battles ahead.